Here are some of the numbers that helped define the Packers 27-13 win over the Philadelphia Eagles on November 28. The Packers have had a losing record on Monday nights during the Mike McCarthy era. Even with yesterday’s win, the Pack is 7-8 on Mondays since 2006, although they have now won three straight on Monday. Davante Adams had a pair of TD receptions in the game, the second time in his career. Green Bay is 18-2 in the last 20 games when a receiver gets two or more TD receptions in a contest. The Packers have won six of the last seven games on the road when they score first. Since 2006, the Pack is 25-15 when they score first in an away game. Green Bay had a 14-10 lead at halftime. Since 2010, the Packers are 22-6 when they have the lead at halftime in a game on the road. They have won 12 of their last 13 road games when they have the lead at half. Green Bay held a 17-13 lead going into the fourth quarter. The Packers have now won 11 straight when they have a lead of three points or more in a road game going into the fourth quarter. The Packers scored points in all four quarters in the game. They have now won 15 straight when they score in all four quarters; they are 85-15 in their last 100 games (dating back to 1995) when they score points in each of the four quarters. Adams had five receptions for 113 yards. It was his fourth career 100-yard receiving game… the Pack is 3-1 in those games. The Packers offensive line did not allow a sack in the contest. Since 2010, the team is 7-2 when the QB is not sacked in a game. Since 2000, the Packers are 31-10 when they do not allow a sack in a contest. 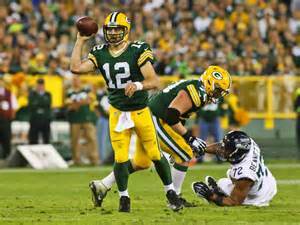 Aaron Rodgers completed 30 of 39 passes (a completion percentage of 76.9). In the 25 starts when Rodgers completed 75% or more of his passes, the Packers are 24-1. The only loss was in 2010 to the Chicago Bears. The Pack did not have a turnover in the game and is 16-3 in their last 19 games when they do not turn over the ball. Since 2000, Green Bay is 61-9-1 when they have zero turnovers in a game. Here are some of the numbers that helped define the Packers 47-25 loss to the Tennessee Titans on November 13. Demarco Murray scored on a 75-yard run on the first play from scrimmage in yesterday’s game. It was the second longest run for TD versus the Packers since Adrian Petersen scored on an 82-yard run versus the Pack in 2012. It was the second longest TD run by an opponent since 1994. The Titans scored 21 points in the first quarter, the fourth time since 1970 that the Packers allowed 20 or more points to the opposition in the first quarter. The last time was in 2004 when Indy scored 21 in the first quarter. It was the sixth time since 1970 that the Packers allowed an opponent to score 35 points in the first half. They are now 0-6 in those games. Marcus Mariota had four TD passes for Tennessee, the 20th time since 1970 that an opposing QB had four or more TD passes in a contest versus Green Bay. The Packers are 5-15 in those games. Davante Adams had a career-high 156 yards receiving yesterday, and Jordy Nelson had a career-high 12 receptions. Nelson has scored a TD in seven of the Packers nine games this season. The Packers offense allowed five sacks in the game and are now 4-20 since 2000 when they allow five or more sacks in a game. Green Bay had three turnovers and are now 2-9 since 2010 in games where they have three or more turnovers. In the Packers four wins this year they have had three turnovers; in their five losses they had 11 turnovers. Tennessee did not have a turnover in the contest. Green Bay is 14-27 since 2000 in games where the opponents do not have a turnover. Aaron Rodgers had a pair of interceptions; Green Bay is 7-7 in regular season games when Rodgers has two or more picks. The 51 pass attempts by Rodgers were the third most in a regular season game in his career. Green Bay is 4-5 after nine games. Since 2000, the Packers have been under .500 after nine games in 2008 (4-5), 2006 (4-5), 2005 (2-7), 2003 (4-5) and 2000 (4-5). The only season they made the playoffs in the above seasons was in 2003. Tennessee running back DeMarco Murray had 123 yards rushing on 17 carries. Since 2000, the Packers are now 31-35-1 when an opposing runner gains over 100 yards in a contest. Tennessee averaged 7.6 yards per play in the game. It was only the 13th time since 1970 that the Packers allowed the opponent to gain over 7.5 yards per play in a game. The Packers are now 4-9 in those games. Green Bay is now 1-10 since 1970 in games where they allow 45 or more points. The only win was in 1983 when the Pack defeated Washington, 48-47. 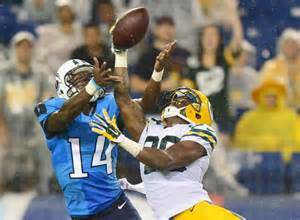 The Packers “D” allowed 446 total yards to the Titans. Since 2000, Green bay is now 31-27-1 in games where they allow the opposition to gain over 400 total yards in a game. They have lost four of their last five when they allow 400 or more total yards. Here’s a look at some stats you might not know from the Packers 30-20 win over the Lions. 1. Micah Hyde returned his second punt for a TD in 2014 yesterday. He became the fifth Packers player to have two or more punt returns for TD in a season. The last player was Will Blackmon in 2008. Other Packers with two or more punt returns for TD in a season: Desmond Howard, three in 1996; Willie Wood, two in 1961; and Billy Grimes, two in 1950. 2. The Pack had a 7-0 lead over the Lions after the first quarter. They had the lead after the first quarter in 10 of their 16 games this season, compiling a 9-1 record in those games. (The only loss was in the first game of the year versus the Seahawks; the Packers led after the first quarter, but eventually lost the game.) 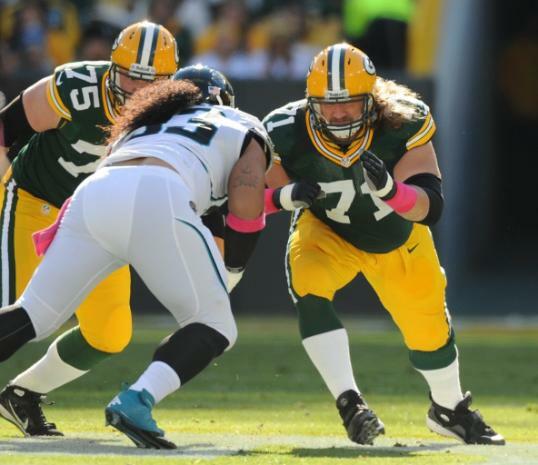 Green Bay is 38-7-1 (.837 winning percentage) since 2010 in games where they have the lead after the first quarter. 3. The Packers ended the season with only 13 turnovers, tied with New England for fewest in the league. Only four teams previous to this year had 13 or fewer turnovers in an NFL season: San Francisco, 10 (2011); New England, 10 (2010) and Miami and the New York Giants (each 13 in 2008). The previous turnover low for the Pack in a season was 14 in 2011. 4. Detroit receiver Calvin Johnson had a pair of TD receptions in the contest. Since 1966, the Packers have allowed 115 receivers to have two of more TD receptions in a game. Johnson has now had four such games versus the Packers, most of any opponent receiver. 5. The Packers fell four points short of setting the team record for most points scored at Lambeau Field in a regular season. They ended the year with 318 points at home, an average of 39.8 pts. per game. The team record is 321 points scored by the 2011 Packers. The 2014 Packers became the fourth team in NFL history to score 300 or more points at home in a season, joining the 2011 New Orleans Saints (329 points), the 2011 Packers (321 points) and the 2013 Denver Broncos (316 points). 6. Jordy Nelson (13 TDs), Eddie Lacy (13 TDs) and Randall Cobb (12 TDs) became the third trio in football history to score 12 or TDs in a season for a team. They join the 1961 AFL Houston team and the 2013 Denver Broncos with three teammates with 12 or more TDs in a season. 7. The Packers had a 21-14 lead over the Lions going into the fourth quarter in yesterday’s game. With the win, the Packers are now 40-2 (.952 winning percentage) since 2011 in games where they had the lead going into the fourth quarter. They have now won 44 straight at home in games where they had the lead going into the fourth quarter. The last loss was on October 14, 2007 when they had a three-point lead over the Bears going into the fourth quarter, but lost the game 27-20. 8. Aaron Rodgers had a rushing TD in the game. 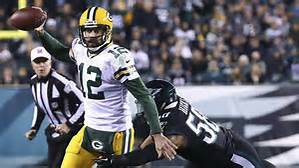 The Packers are 12-10 (.545 winning percentage) in games (including playoffs) where Rodgers has a rushing TD, but they are 7-2 at home in games where Rodgers has a rushing TD. 9. Dom Capers defense held the Lions to a pass completion percentage under 50% in the game. Since 2000, the Packers are 42-10 (.808 winning percentage) when they hold their opponents under 50% in pass completions in a game. 10. Green Bay has now won 43 consecutive games at home when they hold the opposition to 20 or fewer points in a game at Lambeau. The last game they lost at home when opponents scored 20 or fewer points at Lambeau was in November of 2005 when they lost to Minnesota 20-17. 11. The 2014 Packers finished a perfect 8-0 in games at Lambeau. They became the fifth Packers team to go undefeated at Lambeau in a season. The other years: 1996, 1997, 2002 and 2011. The Packers won the Super Bowl after the 1996 regular season as the #1 seed; they were the number 6 seed in their last Super Bowl-winning year.